The rituals in connection with Pooram of all temples are more or less same and there will be slight difference depending on which side the deity is facing. 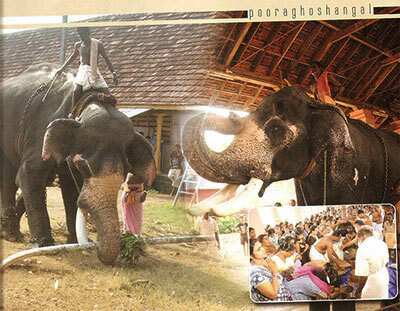 The Kodiyettam or flag hoisting ceremony is conducted by three different modalities, One as "Dhwajadi" 2)"Anguradi" 3)"Padahadi". Of all "Padahadhy is the the oldest form and more liberal. Flag hoisting is done with out any tantric rituals. The post is to be fixed after the Valiya Balikallu and in between outside "Balivattom" & "Ana kottil". The length of the flag post should be less than the distance between valiya balikallu and nalambalam. The length of the flag stick should be less than the length of fins of nalambalam. The stick should point towards north. The surface of the areca nut tree should be chipped in eight sides. The post should be decorated with Darba, mango leaves & banyan tree leaves in odd times. this ritual in connection with the celebrations. 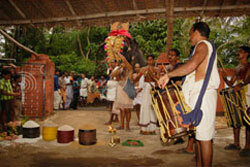 Right from the day of Kodiyettam to the last day " Bali" is performed with strict discipline. 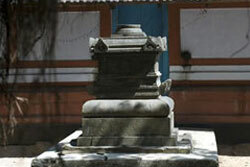 There are specific spots marked with "Balikallu" round the shrine and outside the nalambalam. The thidambu (the replica of deity ) is taken out from the shrine with special vadhya called "Valiyapani" The ritual is pouring "havis" (rice with flowers etc) in the places marked and some unmarked spaces . Bali is the offering to both natural and supernatural powers both good and bad with respective mantras. 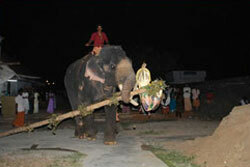 The Thidambu is taken out to the kadavu (Special place in the temple pond) accompanied by drums etc. 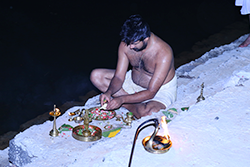 After pooja the thantri immerses the thidambu in the water. After this the thidambu will be applied with cosmetics like sandal water, rosewater & turmeric. With new dress (PAATTU) and short pooja & offerings deity will be taken back to temple. This is a daily routine during the 8 days. 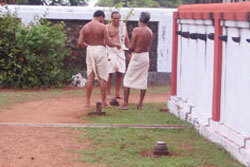 The festivals in Kerala is related to harvest. During the 8 days of pooram the thattakam (domain of influence) will be in festive mood. All the houses will be painted and decorated. The streets will be cleaned and illuminated. 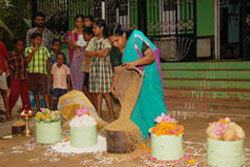 The god will travel along the streets with all pomp and show and devotees will offer paddy, fruits etc. The concept is the presiding deity of the place is personally verifying the well being of the devotees and if there is any complaints it will be solved before pooram. 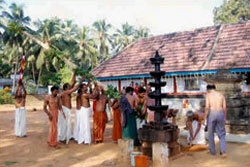 The bali is performed after the night rituals in the temple on the day of kodikuthu. 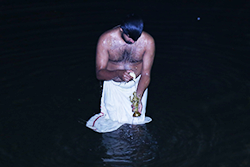 It is believed that holy sprits are stationed at entry points to domain, certain trees, around other temples, ponds etc. The chief priest and thanthri presents the offerings at these points in the presence of the deity who is traveling along with. This is nearly an extinct ritual due to the vast area to be covered. This the last program of pooram festival. After the holy dip in the temple pond goddess travel back to temple. 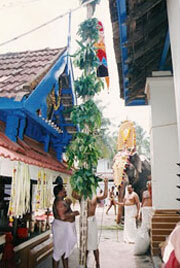 In between arattukadavu and the flag the kodikalpooram is conducted. 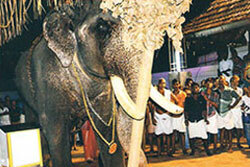 After the pooram the elephant which is honored to carry the thidambu pulls down the flag with post. After the sree boothabali the goddesses enter to the sanctum sanctorum and with "Uttram pattu" the god take rest.